This outstanding Painting and Related Media project was completed by Abby Hope Skinner while studying A Level Art and Design at the International School of Paphos, Cyprus. Abby achieved 98% overall for A Level Art (100% for AS Art and Design) and was awarded Top in the World for the CIE June examinations, 2012. 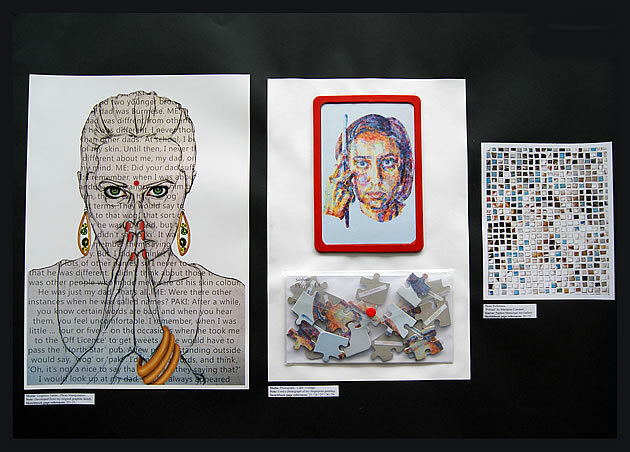 Her A2 Coursework project explores the theme ‘Identity’. She submitted 9 x A1 sheets of preparatory work, an A4 sketchbook and an A3 final piece. The Student Art Guide regularly features exceptional high school Painting projects; it is rare that we stumble across one that is such a valuable learning opportunity for both students and teachers as this one. Abby’s project provides a clear sequence of development, personal responses and analysis of relevant artists. Her project is a comprehensive body of research, exploration and investigation of ideas – the result of a passionate, highly skilled student. We interviewed Abby to find out more: her informative responses, along with detailed images of her artwork can be found below. 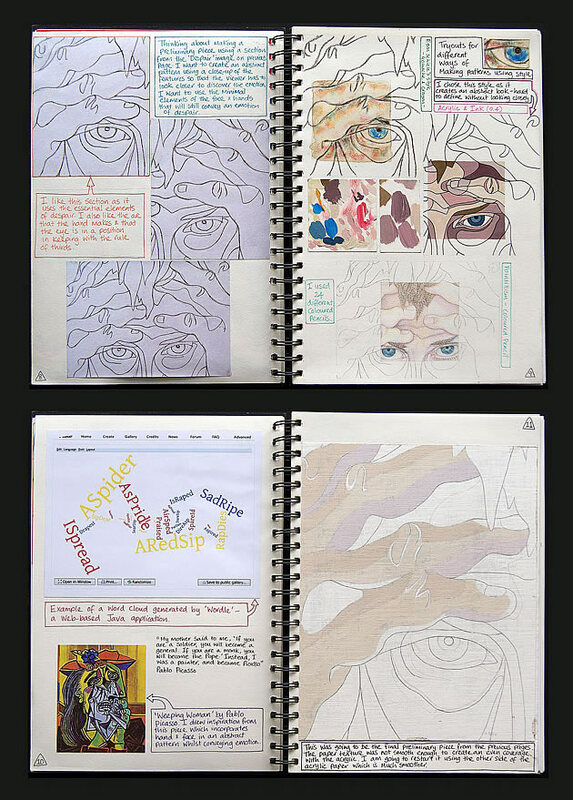 These A Level Art sketchbook pages show Abby’s initial brainstorming and investigation into the theme ‘Identity’. Mind maps and collages of photographs and other paper documents serve to collect, arrange and organise ideas. Your project explores the theme of Identity. Talk me through why you selected this theme and which particular aspects of identity you explored. 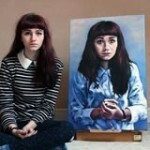 Abby: I was able to choose any subject for my A Level Art exam. The process that works for me, when deciding on a project, is to start with a topic or style that interests me. At the beginning, I’m not concerned if I don’t know where the topic will take me. This flawless sketchbook page (so beautiful I had to enlarge several sections!) 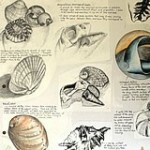 contains an array of techniques and mediums, accompanied by thoughtful annotation: a superb example of A Level Art sketchbook presentation. I would say that it’s possible to start with any idea. I believe it’s more how you develop the idea that counts. I decided to combine my interest in portraiture with a graphic, abstract style, which I have used in the past. I wanted to explore a graphic ‘planar’ style that I had developed prior to beginning this project. I started to think about how abstraction can challenge assumptions and prejudgments. Abstract art can separate us from the ‘known’ and force us to see things anew. I began my preliminary work by abstracting the human face into a graphic pattern. It’s possible to become blind to the real person by building a filter of our own ‘images’, and so (whether they be a family member or a stranger) we prejudge that person. I wanted to explore ways of bringing awareness to this. 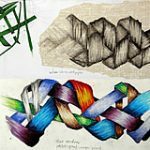 Combining artist research, analysis of ideas, media exploration and the refining of techniques, Abby produces beautiful, comprehensive sketchbook pages. In most cases, a project evolves, and, at some stage, there is a ‘tipping point’. It’s as if a particular theme or message materialises and encapsulates all you want to say. I often come to this through extensive research and/or experimentation. 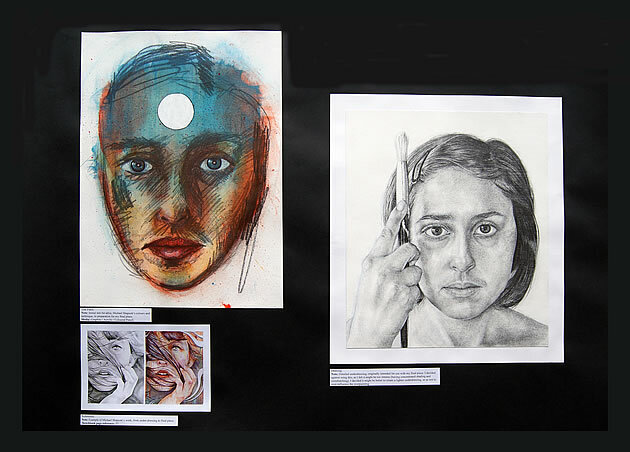 My A Level project evolved from ‘Hands and Faces’, to ‘Prejudice’, to ‘Identity’. I finally narrowed this down to the theme of ‘My Identity’. I believe it’s essential to focus a project on a specific theme. ‘Prejudice’, as a topic, is very wide, and therefore the message can be diluted, whereas, ‘My Identity’ is more personal and focused. I start my projects with a broad area of research and then narrow my focus into a more specific, targeted theme. I feel, the more personal and specific a project is, the more emotionally connective it tends to be. For me, emotional connection in art is one of the main requisites. In my opinion, it’s this approach in art that’s capable of changing or challenging a viewer’s outlook. This image shows sketchbook pages leading towards Abby’s first A1 preparatory sheet, which contains three finished artwork. The sketchbook contains research, experimentation, analysis and annotation; the prep sheets contain the finished pieces which arise out of this exploration. It is worth noting that Abby has separated her project into discrete stages; each investigating different artists and different interpretations of her topic. The collection of sketchbook pages above lead toward her second A1 prep sheet (with enlarged artworks from this shown below). These three A Level artworks are from the prep sheet above: duplicate compositions, each rendered with a different skin tone. It is clear that Abby has an exceptional level of technical skill, as well as confident handling of media. I think I had an underlying need to ‘speak’ about identity and my feelings of not belonging to any particular group. I am mixed-heritage and have lived away from most of my family since the age of 8. And, like most people, I’ve experience a certain amount of prejudice about ‘who I am’. I decided to use symbols, such as masks, and different styles and forms of self-portrait to discover what best expressed my message. The process was interesting, in that it revealed I primarily identify myself as ‘an Artist’. Your A2 Art submission is exceptionally comprehensive, with separate sub-projects leading towards the development of your final piece. Please describe how you approached and structured your Coursework project. Abby: It was my responsibility to devise my own method of working, from idea to production. My teacher would check my progress every week, but I was encouraged to be self-reliant. I read and referred to the syllabus quite often. I also gleaned information from various websites, including the Student Art Guide. Because I wasn’t certain what was required to achieve a good grade, I suspect I over-compensated with the work. This had an upside and a downside. As a result of working this way, I achieved a high mark. But my work-life balance was out of kilter, and the pressures were, at times, enormous. Some students begin a project with enthusiasm, but are unable to maintain this for the duration of their project. Abby’s A2 Coursework submission remains detailed and comprehensive throughout. Keeping to a consistent presentation style, Abby produces page after page of beautiful visual and written investigation. I continually pushed my project by conducting research, seeking out the crux of what I wanted to say in my art. I started with a subject, found a theme within that subject, and then settled on a final message. From then on, any research and experimentation I did was directed by that message. I think it’s important to research a variety of theoretical contexts in addition to artists and techniques. For instance, I drew inspiration from literature, music and philosophy. I find this adds more depth to the message. I worked through the three stages of the creative process – ‘idea generation’, ‘research and experimentation’ and ‘production of the final piece’. This helped to form a complete and rounded project. This sequence of work shows two A Level sketchbook pages leading towards a vertical A1 prep sheet (enlarged detail shown to the right). Note the inclusion of innovative painting techniques combined with collage. Here, Abby begins to break away from more conventional painting and drawing methods and begins to ‘push the boundaries’, incorporating contemporary approaches (such as the jigsaw pieces).This helps to demonstrate that she isn’t afraid of taking risks and is a creative, innovative student. You have selected an interesting range of relevant artist models – something many students find challenging. How did you go about selecting these artists and what guided your choices? Abby: I think it’s important to select an artist for a reason. It can help if their work or life (or identity in my case) relates to your message. I researched artists specialising in portraiture. 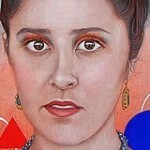 I took inspiration from the artist, Frida Kahlo, who painted many self-portraits. I formed the opinion, after analysing her work and researching her life, that her art expressed her struggle to console a dualistic identity. I believe this was a result of her mixed-heritage. In all cases, I attempted to interpret the artists’ work I referenced and integrate their style or message into my own work. I emulated styles, but never directly copied. I referenced contemporary artists as well as historical artists, which gave me a broad insight into a variety of methods, both traditional and modern. Researching ‘unknown’ contemporary artists, I believe, keeps the work relevant by revealing trends in style, theme and topic. It’s a good idea to look at websites that host artist communities. These present many different artistic styles. The artists often share a link to their personal blogs, where they may talk about their process or ideas. Unfortunately, I was unable to see any famous art first-hand, however, I visited a few galleries in Cyprus and was able to see the work of contemporary Cypriot artists. It was beneficial to study art from a different culture. Culture shifts an artist’s perspective. New symbols and means of expression are available. I contacted a local Cypriot artist, Andreas Charalambides, whose work contains the recurring symbol, masks. Different interpretations can often lead to an expansion of your theme and idea. In all forms of research and experimentation, the message was my guiding light. These sketchbook pages and accompanying prep sheet show the development of ideas for a mask and photographic study. It is important to note that working in other creative disciplines (such as sculpture and photography) can inject welcome variety into a Painting and Related Media project and can help inform and influence subsequent drawings and paintings (see below). 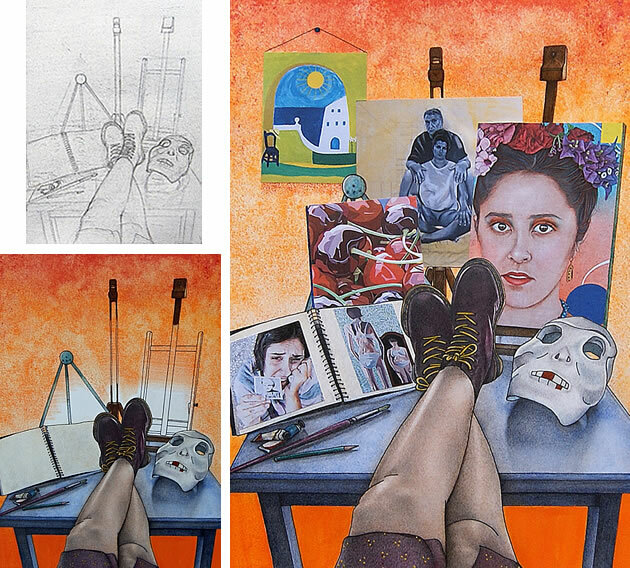 This section of Abby’s A Level Art portfolio shows excellent reference to first-hand sources. Here she completes observational line drawings of still life items (relating to her identity as a young artist – paint brushes, easels, artwork) arranged on a studio desk. The compositions communicate the essence of Abby’s identity, without the inclusion of a typical self-portrait – an innovative way of approaching a self-portrait. This mixed media artwork combines photographs of Abby’s paintings (including her final A Level Art Coursework image, which was added towards the end of the course) with a drawn / painted table scene. Photographs of the existing artworks have been digitally manipulated using Adobe Photoshop (so that they appear to be angled away from the viewer – abiding by rules of perspective – and then printed, trimmed and seamlessly collaged into the work. The initial drawing and painted ground can be seen in the images to the left. One of the most striking aspects of your project is your high level of technical skill. You have an impressive ability to replicate forms, proportion and detail. What do you believe contributed to your ability in this area? Abby: I attended art lessons outside school, beginning at the age of 13, for 4 years. We focused on producing work from still life, but mainly from photographs. This practice helped hone my skills in replicating forms and I was introduced to many different media. As with anything, in order to become skilled, practice is key. From a young age, I would carry a sketchbook everywhere – pens and paper were always with me. I did a prolific amount of drawings. My parents tell me I was always a perfectionist. Although I now realise perfection is unattainable, I continue to strive for it. I can always ‘do better next time’. My advice for artists who wish to improve their realism would be to practice observational drawings. 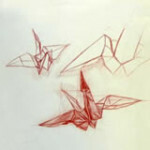 Try to dispel what you think the ‘tree’ or the ‘glass’ you’re drawing looks like. Really see the positive and negative spaces. Everything is a shape. Learn your trade from the ground up. Mastering the technical skills in art gives you a foundation to build upon. Learn the basic drawing and painting principles, perspective, the grey scale, dead-layers, etc. 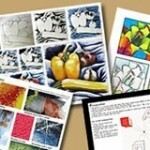 Go beyond school, and learn about your tools and the grounds (paper, canvas, etc) available. Then add your artistry and flair to these skills. Earn the right to be experimental and avant-garde by having a solid grounding in the fundamentals. No matter what the assumption about art is, I believe it’s important to see yourself as an artisan first and then an artist. 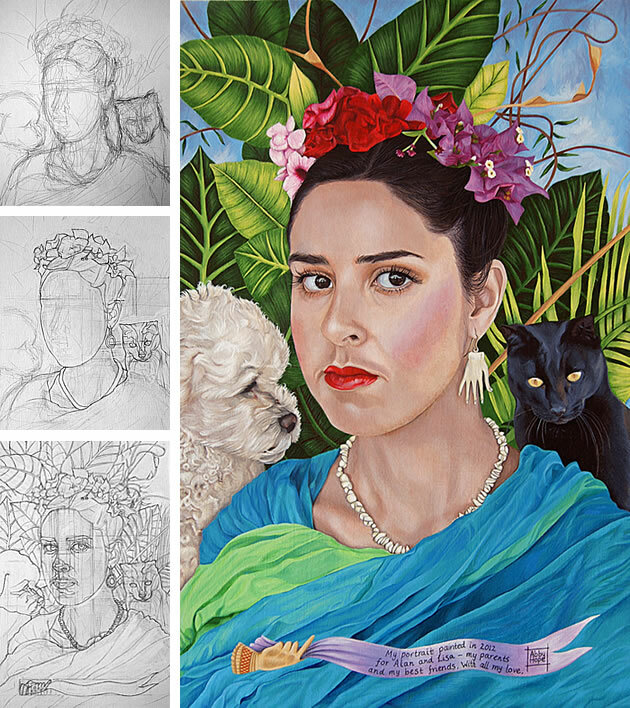 This section of Abby’s Coursework project shows first-hand responses to subject matter (self-portraits of herself in the style of Frida Kahlo, posing with a cat, dog and plants). The photographs of her work in progress are captivating (normally these are not required; in this case they provide stunning evidence that under-drawings have been sketched entirely by hand, with proportions gauged by eye). 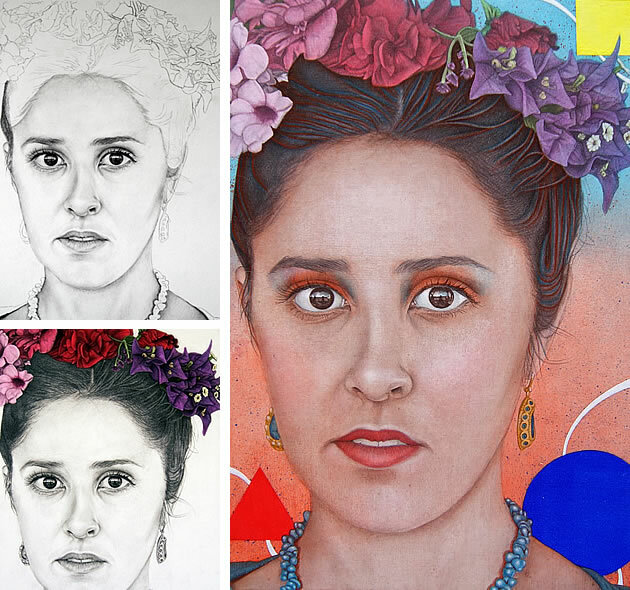 This accomplished painting demonstrates immaculate painting and drawing skill: a personal interpretation of a Frida Kahlo self-portrait. What advice do you have for other high school Art students who hope to achieve excellent grades? Abby: Certain skills may come naturally to some more than others, but, I think the attributes that make a great artist are persistence, focus, and commitment. In my view, artists with these attributes will soon surpass those who rely solely on natural talent. Natural talent is not enough to make a successful artist. You have to continually progress, improve, and push yourself. Too many students think studying Art is an ‘easy option’. They fall prey to the romantic image of the eccentric, care-free artist. History has shown that succeeding as an artist is hard work. In most cases, an artist needs to be self-motivated and able to switch between a creative mind and a practical mind: empathetic, open-minded, perceptive, whilst organised and efficient. 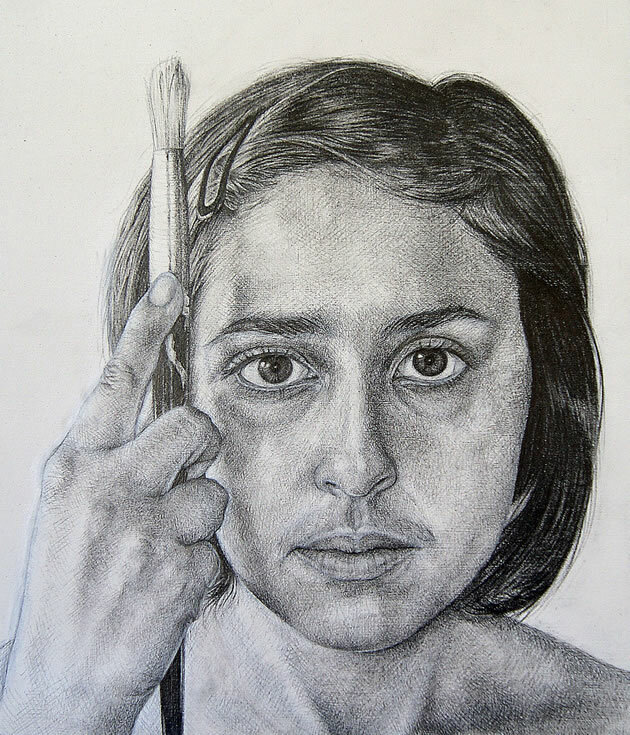 In this A Level Art prep page, tight, analytical drawing contrasts with expressive, gestural mark-making inspired by portrait artist Michael Shapcott. 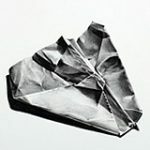 This graphite pencil drawing demonstrates highly accurate representation of detail, proportion and form. Perfectly composed, this self-portrait has an arresting gaze and a well positioned vertical line of the paint brush. Although most people see it as an escape from academic work, I think the research and the organisation involved in producing a piece of art requires a degree of academic mindset. I think my interest in Literature, as well as other academic subjects, has benefitted my work. My best advice would be to make what you do relevant, emotionally connective, original and technically adept. That’s what I keep in mind when I’m creating a piece of art. One of the artists I interviewed for my A Level Art project advised me to create work that ‘speaks about the world around us’. So, make your work current and attainable for modern audiences. Don’t get stuck in the past, unless the past is relevant to you today. Most of all, have an opinion on your world, and then go and express it through your art! With meticulous organisation, Abby works towards her final piece. 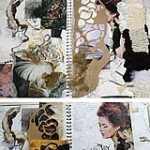 This sequence of sketchbook pages shows a self portrait that brings together ideas from her earlier work. Abby’s final piece is A3 in size, integrating realism with abstract elements. The work is painted in acrylic, over a detailed, exquisite, graphite underdrawing. Abby Hope Skinner is a talent to watch. She has recently finished her Foundation Year in the UK, where she was awarded a Distinction and the Principal’s Award for ‘Best in Show’ for her 2013 Summer Exhibition. We will feature more of Abby’s exceptional high school Art projects in the months to come. If you found this Art project helpful, please share it using the social buttons below!